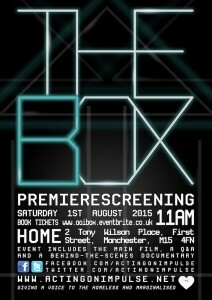 We premiere our latest film THE BOX at HOME, tomorrow, August 1st. Our 25 actors with guest artist Kavana will see themselves up on a state of the art screen at Manchester’s newest Arts Venue, in front of a capacity audience. They’ll see the story they created themselves, along with co-writers Ed Lilly (screenplay), Joe Chambers and Lauren Pouchly. It’s going to be a riveting piece of cinema, our first full length feature, made over 5 days. We’re so proud of our guys, many of the crew assumed they were professional actors. Listen and watch out for goosebumps! Ben Morris is excellent as Thomas Rip Cord. Ben Morris was the best Iago I have ever seen in Manchester. God Bless You it is so rewarding to create a character alongside Jeff Hordley in a Capital Theatre Production.